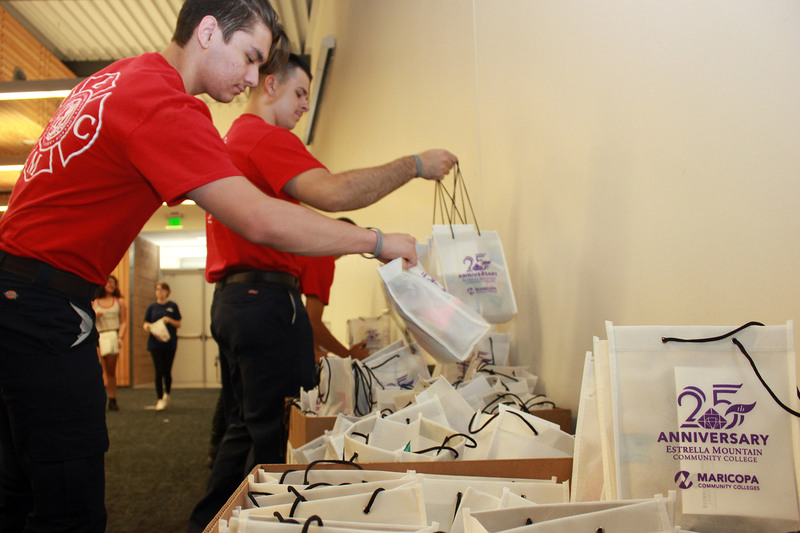 EMCC students build care packages for Avondale first responders. (Left to Right) City of Avondale representatives Stephany Torres, Fire Division Chief Ben Avalia, Fire and Medical Community Outreach Coordinator Sue Anglin, Katie Briggs, and Police Department Volunteer Coordinator Debbie Ray. More than 330 care packages were assembled for local first responders and public safety personnel. As part of an Estrella Mountain Community College (EMCC) Day of Service and Remembrance, on Monday, Sept. 11, students gathered with faculty and staff to help assemble 331 “care packages” for fire, medical, police, and civilian-support personnel, as well as EMCC Public Safety employees, to support them while they are at work in the field. The event was coordinated in partnership with the City of Avondale as a service learning opportunity in honor of national 9/11 Day of Service outreach and the EMCC 25th Anniversary. The experience was extremely impactful for participating students from EMCC’s Emergency Medical Technology (EMT) and Fire Preparatory Academy programs. These direct connections between college and careers show students the bridge between higher learning, employment, and connection to the community. Each package contained a variety of items including personal hygiene products, snacks, drinks, and a hand-written note of gratitude from a student. 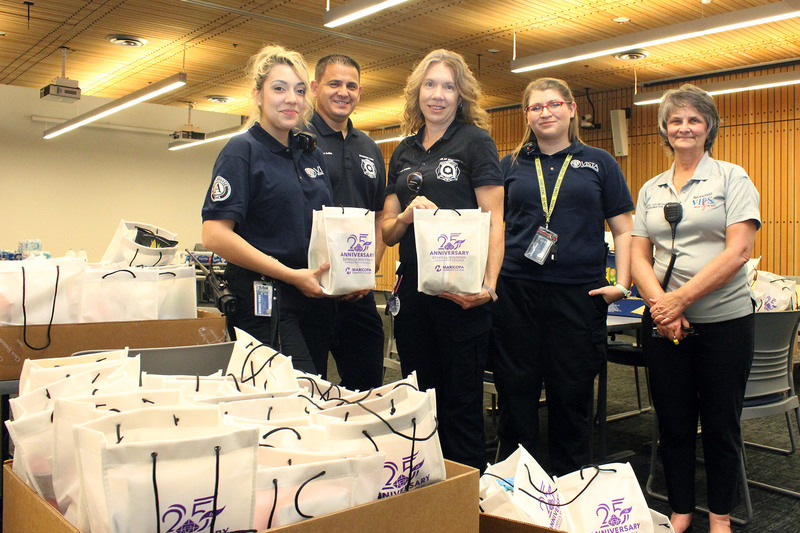 After the packages were assembled, City of Avondale representatives and volunteers picked up the care packages to distribute to first responders, public safety personnel and support staff. EMCC faculty, staff, and students recognize and give thanks to all those who helped make this a successful event, through donations of needed items and volunteer time. As EMCC celebrates its own 25-year anniversary, it continues to strive to develop and strengthen relationships with members of the community. By building bridges with members of the working community, like first responders, EMCC students – and future leaders – get a firsthand look at how they can apply facets of their learning to practical situations.